It might not be quite as long as the Missouri River or the Mississippi River, but the Columbia is still one of North America's most iconic and exceptional rivers. Starting in British Columbia, Canada and flowing for 1,243 miles in total before reaching the Pacific Ocean along the border between Oregon and Washington State, the Columbia is the biggest river in the Pacific Northwest. The river has a lot of history behind it, including playing a key role in the famous Lewis and Clark Expedition of 1805 to 1807, and passes through some stunning scenery, making it one of the best river cruise locations in all of the United States. A river cruise of the Columbia River offers travelers a unique way to get in touch with American history and nature, stopping off along the way for various nature walks, museum tours, wine tastings, and a full range of additional activities. Cruises of the Columbia River run from April to November of each year, and there's not really a best time for Columbia River cruises as the scenery is always beautiful and the conditions in the area don't change too much, but the best weather can be enjoyed in July or August. Various cruise lines run cruises of the Columbia River including American Cruise Lines, USA River Cruises, UnCruise Adventures, and National Geographic. Each cruise has its own unique features and advantages, with prices and durations varying from one cruise to the next. Read on for some key details on the best Columbia River cruises. Climb on board National Geographic's Quest or Sea Lion for a wonderful tour of the Columbia and Snake Rivers. This tour takes in the major sites along the Pacific Northwest's biggest river including Columbia River Gorge and Hells Canyon. Passengers will be able to try kayaking and jet boat tours among the rapids of the river while also enjoying fine dining with locally-sourced ingredients on each and every day of their trip. Nature and history experts will be present on board to inform passengers on the history and wildlife along the river, making this Columbia River cruise both exciting and educational. If you don't have too much time to spare but still want to experience the majesty and beauty of the Columbia River, this cruise could be the right option for you. It only lasts for four night and five days, setting off from Portland and taking in some of the best local sights like Multnomah Falls and the Astoria Column before heading back to port. Lots of cabin styles can be chosen on board the American Empress and plenty of live entertainment will keep you occupied in the evenings. 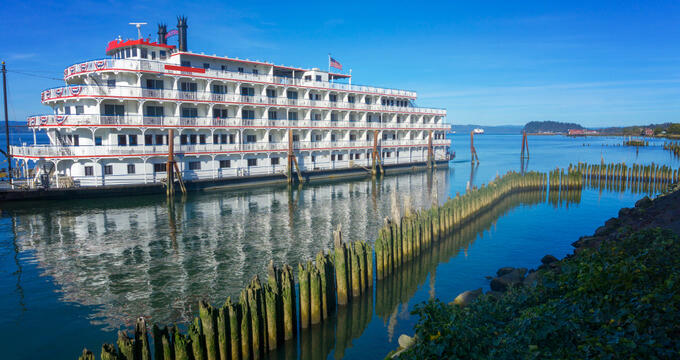 The 7 Night Columbia River cruise from UnCruise adventures covers the Columbia, Snake, and Willamette Rivers. This cruise is well-rated due to the friendliness of the staff and the real bonds they form with the passengers. This cruise is a personal experience for everyone with a very friendly atmosphere on board, and lots of fun activities are lined up each day including wine-tasting, swimming, kayaking, hiking, rafting, and more. Passengers can choose between fully wine-based cruises, adventure cruises, or a mixture of activities depending on their own personal preferences. American Cruise Lines' 8 Day Columbia and Snake River cruise takes in a long list of breathtaking sites including the Multnomah Falls and Mt St Helens. Passengers will be blown away by the scenery all around the Columbia River Gorge, with on-board experts offering guided tours to Mt St Helens too. Other activities include wine-tastings, live music shows, and more, and all passengers will surely appreciate the upscale rooms and top-quality cuisine offered on board these vessels. If you've got a little extra time to spare, this 9-day cruise from USA River Cruises offers a sensational way to experience the full depth and wonder of the Columbia River. All the major sites will be seen on this cruise including Bonneville Dam, the Astoria Column, Multnomah Falls, Mt St Helens, and more. Activities include scenic bus tours, museums, wildlife spotting sessions, city tours, hiking excursions, and more. Don’t miss out on this incredible Columbia River cruise.